1935 Spanish Style House "AFTER"
Removing the wall between the kitchen and dining room, and between the kitchen and laundry, made this small kitchen feel larger, more functional, and more inviting. The laundry area was incorporated into the narrow entrance at the back door. 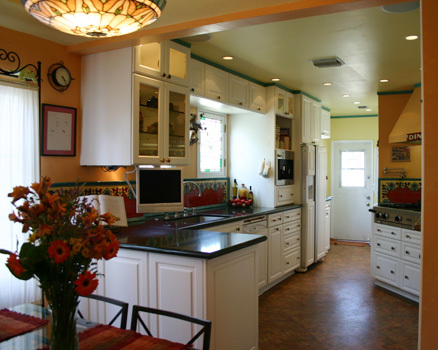 The custom Mission-style tile backsplash defines the look of the kitchen. The warm colors continue on the ceiling, walls and flooring to exemplify the traditional characteristics of the 1935 Spanish style house.